KinderGarten Are you ready for this baby-driven challenge? Run your own day care center! Hire a nanny or a clown! Keep the babies happy! Kindergarten is a fun-filled, colorful and interactive management game were you play the super sweet owner, Mila, of the day care center. Help Mila take care of the babies that get dropped off by their mommies! Make sure that you take good care of the babies and that you keep them happy. Not only is this very important for the babies, but it will also earn you money! 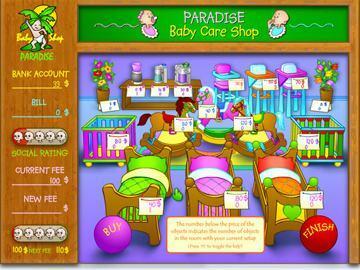 Once you earn money, you can start buying all kinds of wonderful things to upgrade your day care center! With your earnings you will also be able to hire people to assist you and increase your day care center in size! Lots of different babies with many different needs! 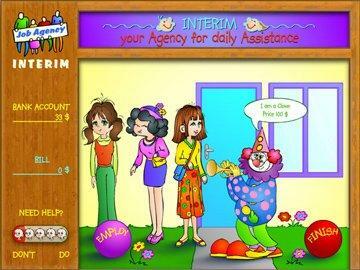 Hire your own assistant nanny, clown, cook, and more! High-quality and entertaining cell animation! YOU decide how you will use the kindergartens' earnings! Tons of upgrades for furniture, equipment and more! Multiple action selection and de-selection! Hire temporary or permanent employees! Click-in sequence of multiple actions. Remove them by shaking your mouse!